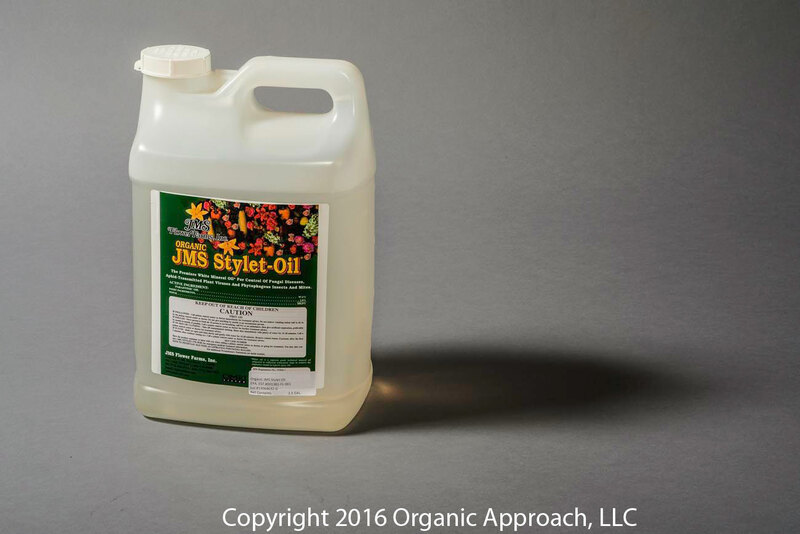 Introducing JMS Flower Farm’s Organic JMS Stylet-Oil! Organic JMS Stylet-Oil contains the same high purity base oil that kills powdery mildew on contact, controls plant feeding mite populations and is safe for field workers and the environment. With its new advanced emulsification system, Organic JMS Stylet-Oil uses only the safest inert ingredients on EPA’s List 4, — but that’s not all. Each component of Organic Stylet-Oil’s formulation meets or exceeds “Food Grade Quality” standards making it a safe, environmentally friendly white oil formulation. Organic JMS Stylet-Oil is one of the few tools organic growers have that can control a number of pests — certain fungal diseases, insects, mites, plus certain viruses — with a single application! Organic JMS Stylet-Oil also acts as an environmentally safe alternative to sulfur for both insect and disease control. Sulfur can evaporate into the atmosphere to combine with water resulting in acid rain, but Organic JMS Stylet-Oil stays on your crops, where you need it. Another plus is that, unlike sulfur, Organic JMS Stylet-Oil is not volatile in temperatures below 65 degrees F, making it the perfect early-season powdery mildew control alternative.